CLIENT : Kekoa Chin-Hidano, a young tech industry alum turned quality coffee enthusiast, who had recently opened a coffee shop within a successful biscuit shop, when he was given the opportunity to take-over the restaurant. He took it under condition that the restaurant would get a fresh brand and his coffee business remained separate to keep alive the coffee business he started, but since it did not yet have a logo, he would need a logo for each. CHALLENGE : We needed a logo for both businesses that could stand alone and together. The client wanted something that was cool and young to reflect his style as well as to appeal to the mostly University student clientele, but the restaurant interior itself would keep it’s light blue “country kitchen” style. They also eventually wanted to evolve into a larger brand, so the brand needed to be versatile and convey quality but remain “down home” to suit the interior and product. After deciding on our logo, then next step was to give the building a fresh look and create a sign. Below are the color variations I mocked up for the client to choose and the final hand-painted signs. 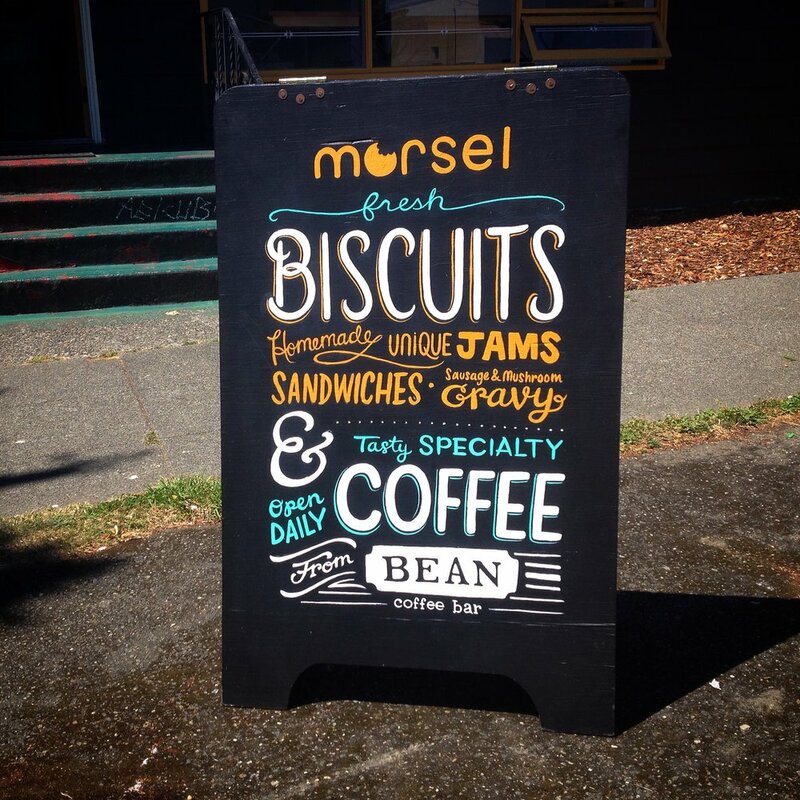 The University chalk sign was made in coordination with the printed menu to be a matching pair of information, as was the Ballard location's menu when the company expanded. Both were hand chalked by me. When the opportunity to open a second location in Ballard came up, we were also given a quick turnaround and yet another challenge of co-branding, since in this location they would be partnering with another coffeeshop called Bean. This time Bean provided it's own branding, but since Morsel had the brand recognition (the University location developed a. consistent line out the door), they were given top billing and I the opportunity to design their exterior. This time proved much more tricky as we would have to build the signage with a tight budget. I came up with this long aluminum printed topper to give framing to the architecture of the building in a way that referenced 50's roadside diners. We then replicated the University A-frame with some added punches. There is now a line out the door every morning at the Ballard location as well. Since the business would be co-branded we needed business card that reflected that, so on one side we have the Morsel info, and on the other side, Sound coffee info. For the exclusively Morsel staff and Ballard location, the back side was left open. These printed menu were used as hand-outs when the businesses were starting new, and as take-out menus from there on. Also with lines out the door, these menus help customers to prepare their order before getting to the counter. I designed them to feel readable, classy and buttery. These gift cards were designed to match the menus and to serve as an easy wallet sized version of the classic printed gift card. Eventually Morsel wanted to upgrade to electronic cards, but in the meantime this was our solution to the demand for gift cards that would be beautiful to gift, but quick to manage at the counter. The chef at Morsel had always planned to commercially sell his in-house made syrups and jams, but we came into a lot of setbacks when realizing all that was needed for commercial distribution. On my end, I struggled with finding them a cost efficient packaging solution for their variety of flavors and limited quantity being made/sold. What we came up with was these sticker/label hybrids. The bottom orange section would be printed on package grade material that could withstand condensation and the top color sticker would be printed through an online sticker company that could do small runs, and stuck on top. For very limited or seasonal flavors the under sticker would have room for hand-writing the flavor name. In the fall of 2015 Morsel came to me to design a shirt for holiday distribution. They gave me free reign to create whatever art I wanted, as long as there was a giraffe involved (Kekoa likes giraffes). I wanted a design that encapsulated what morsel was about, quality ingredients, so I integrated both, into this hand-drawn, leave-you-wondering, illustration. For the holiday of 2016 season we decided to create our runner up idea from the year before : the morsel icon as a sun on a sweet 70's sunrise. After a ridiculous amount of iterations, some trying to limit colors for cost efficiency, the client decided he wanted simple and all the colors so the below were the finalists .